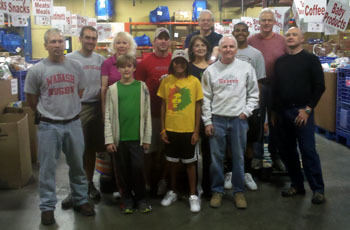 Kansas City alums sorted donated food items into bins for distribution to families in need in the Kansas City area. This has been an on-going effort since the Kansas City Association’s first participation in Wabash Day 2008, where we were inspired to give more and committed to volunteer once each quarter at Harvesters. Regularly, family and friends join in for the service work and fellowship. Volunteer dates for 2011 are: Jan. 8, Apr. 9, July 9, & Oct. 8. We had the good opportunity to fellowship, work side-by-side, laugh, and help make a difference in our community. Afterwards, we gathered for lunch and shared our Wabash stories.